Up From the Top: Normal Life as we know it. Well it seems that I left off over a week ago while on the way to a fun filled beach vacation. As I said, on Saturday morning we did the Farmers Market in New Bern NC, Then drove to Jacksonville where we shopped leisurely at the Camp Lejeune Marine Corp Base Exchange. Early in the afternoon the rest of the family caught up with us, we stocked up on groceries for the week at the commissary, and moved on to Topsail Island. There was still time after unpacking to take a dip in the water so off went our hoard. I was very hot and uncomfortable so I stayed back at the house. I really did not spend much time at the beach, instead catching up on rest, reading, and doing nothing in particular. I did go down to the shore on Tuesday, but it promptly rained. Wednesday I drove up the coast with my Son-in-law Matt and Grandson Payton to meet my eldest Son Loren and his wife Jennifer. They had planned some adventures for Payton through a service in Beaufort NC. These included searching on a local island for sand dollars and a Pirates Treasure Hunt. While they were doing that I did some letterboxing, then we all returned to Topsail for dinner at a local Seafood House. After dinner we planted our own letterbox "The Gold Hole" on Topsail Island, you can read about letterboxing and our Gold Hole box on Atlas Quest. 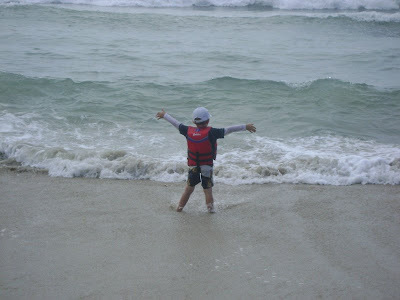 Payton seemed to have enjoyed his week at the beach almost as much as his Mommy. I think he will grow up to be a real beach bum. The first few days were hot and sticky and I am no longer able to play in the waves so I stayed off of the beach most of the time. From Tuesday on, the temperature was milder and the humidity was pretty low. Friday I ventured down to discover that it was really quite comfortable for me if I just sat in the sand at the waters edge and let the waves wash over my legs. I must try to spend more time in the water next year. The week went too quickly. I really enjoyed, and now miss, having the family around. The trip home was long but uneventful. Now we are settling back into our normal mode for a few days, then off to our church's annual business and camp meetings. I did not get many pictures, The two above were stolen from Ellisa's on line album. I am hoping that Loren and Ellisa have many more. Resuming "normal" life is never easy after such a great vacation. We miss you too. Hope to see more of you at the shore next year! !